Our newsletter editor is looking for first hand reports from count participants, especially from those participating for the first time and anyone teenage or younger. Please send any comments or reports to lynkraatz@hotmail.com, subject matter “birds”. Please submit on or before Friday, Jan. 11th to be published in the February newsletter. Also, list your name and city and tell Lyn if you want your last name listed. We expect our CBC report and bird count to be published in our February newsletter. Our preliminary report is 183 species with 4 Count Week birds for a total of 187 species! Count Week birds were Red-breasted Merganser, European Goldfinch, two Short-eared Owls and seven Barn Owls. Our CBC team is still working on the rare bird counts and more, many thanks to all their hard work organizing this important citizen science effort and of course we couldn’t do this without our volunteers—thank you! Oct 13th Nature Center Native Plant Sale & Plants for Birds! Fall is here and now is the best time to plant native plants for birds! 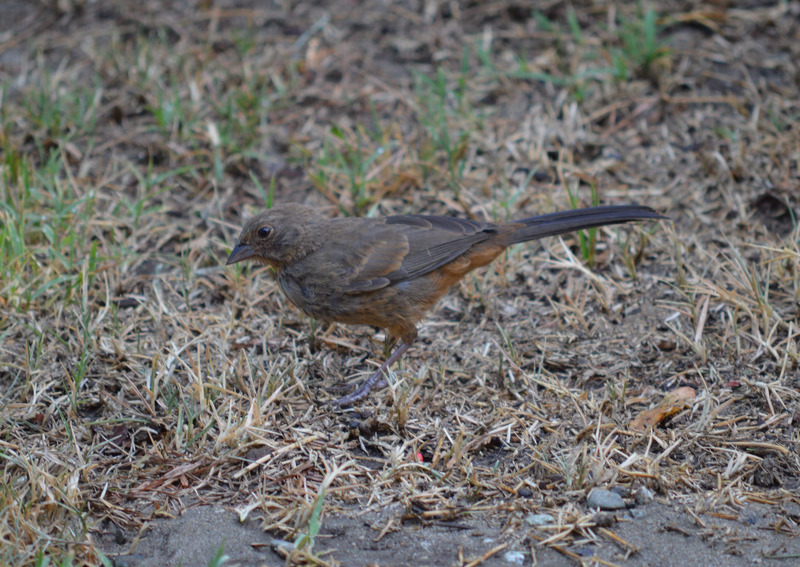 Turning your yard into your own private bird watching habit is easy. Just add food, shelter and water. 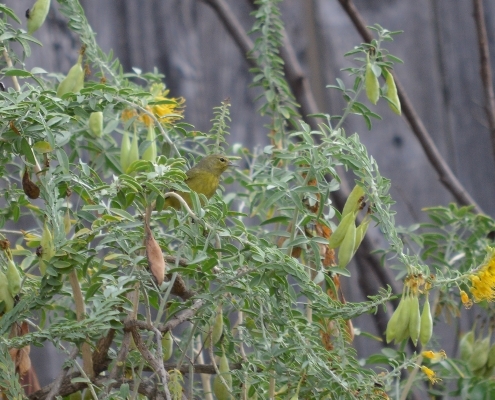 Native plants are an excellent choice for feeding birds the “natural way”, plus they are drought tolerant. No need for pesticides, California native plants are bug resistant and besides, the birds will be more than happy to take care of that problem for you! A great local resource for Native Plants for birds — The Nature Center is holding their annual Native Plant Sale, October 13th, Friends Members Preview Sale is 9am to 9:30am, Public Sale is 9:30am to 2pm—arrive early for the best selection! Address is 7550 E Spring St., Long Beach CA 90815. 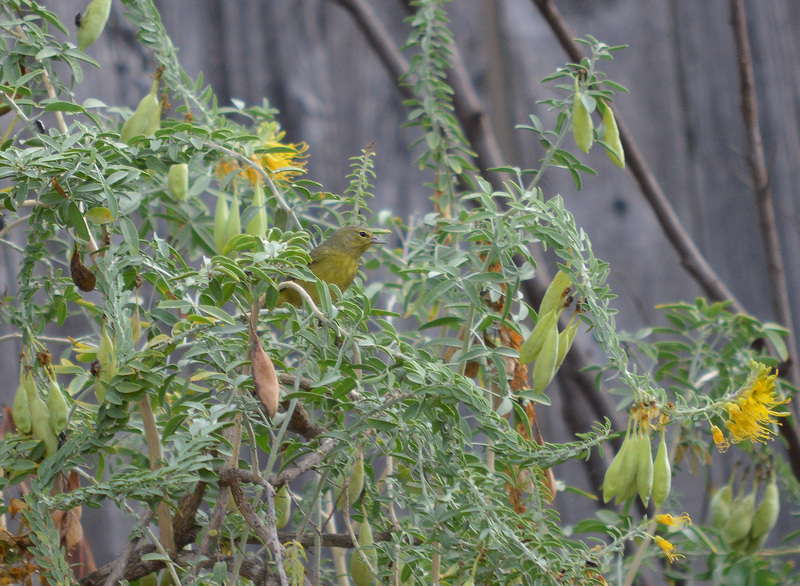 When planting for a bird habitat consider different levels of vegetation. In my yard I have a mix of both native and non-native plants and trees: a giant maple tree, a slightly smaller tangerine tree along with a variety of bushes and plants creating an “understory”. A very tall and thick non-native honeysuckle bush (great hiding place from the Cooper’s hawks) and native Toyon bush are at the next level down. Just a bit lower in height I have native Coyote Bush, Gooseberry and California Lilacs. Next level down are the native sages, Bladderpods and a few other native and non-native small plants. As I watch the Hooded Oriole, House Wren, Goldfinches, Warblers, Scrub Jays, Mockingbirds, California Towhees, Allen’s Hummingbirds, occasional Pacific-slope Flycatcher and a variety of other feathered visitors to my backyard, I can’t help but notice their feeding and perching habits in the different height bushes and trees. The Hooded Oriole seems to favor the high side of mid-size bushes and lower spots of the large trees, apparently catching insects and feeding on flowering bushes, drinking from the pond, and like many other bird species I see, perching on the dead snag next to the pond at times, which changed my plans for removing it. I often see Goldfinches flying through the pond fountain and perching on the dead snag next to the pond, sometimes taking shelter in middle to lower sections of thick bushes and of course feeding on the seeds of low lying native plants—native thistles are a favorite. The Mockingbird most often perches high up in tree tops singing, sometimes taking to the ground to catch insects. The Toyon rarely has the beautiful red berries as these seem to be quite tasty to the resident mocks, along with the native Gooseberries. 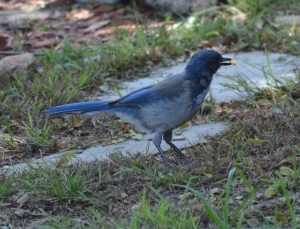 Numerous California Scrub Jays pass through daily, moving between high tree tops, medium under story bushes, finally perching on lower limbs of bushes “in wait”, finally sweeping down on the ground to catch unsuspecting insects. 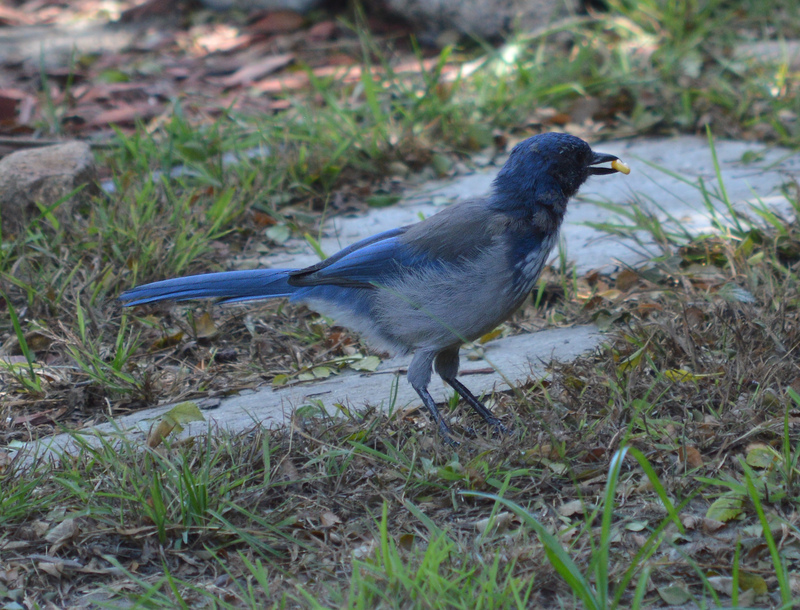 The Scrub Jays also like the dried seed pods on the Bladderpod bush, picking them up and shaking each one as they would a peanut, until they find just the right one. 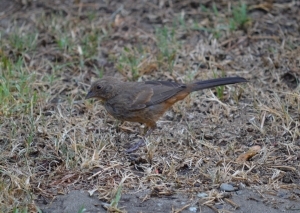 I occasionally see a pair of California Towhees hopping along the ground through sheltered areas under low bushes pecking and scratching through the dirt for a meal. It won’t be long before large numbers of White-crowned Sparrows arrive to join them. In fall I always see a variety of warblers busy at work catching insects mostly in low to medium bushes, sometimes perching on low branches of tall trees or in thick bushes, often joined by the House Wrens, numerous Bushtits and others. https://eldoradoaudubon.org/wp-content/uploads/2018/09/8-16-024.jpg 2582 5074 Cindy Crawford http://eldoradoaudubon.org/wp-content/uploads/2016/02/eldorado.jpg Cindy Crawford2018-09-30 22:29:152018-09-30 22:29:15Oct 13th Nature Center Native Plant Sale & Plants for Birds! Join Our New Volunteer Pool! This is a no pressure, lend a helping hand if and when you can opportunity. Just provide us your name, interests and phone number and when the need arises we’ll give you a call and check if you are available to help. Whatever your interests or skills, EDA has a place for you. All you have to do is like people and enjoy nature. To make our programs successful, we need membership involvement in all of our activities. Donating even an hour or two of your time can help a lot. There are all sorts of fun ways to get involved. EDA will give you the training you need. What would you like to do? Maybe it’s to co-lead a field trip to the wetlands or the wonderful Nature Center, spend a few hours at an information table, help with office duties (make copies, computer help, etc.) or help set up chairs and tables at our 3rd Thursday general meetings, bring refreshments to the general meeting (chapter reimburses for this), help out the newsletter labeling crew (weekday), or help with our 50th anniversary celebration. Or do you have a special business skill or other talent you would like to share? We are open to your suggestions! We’re also looking to form a bird walk/field trip leader pool, for those who would like to get outside and help others discover the world of birds. If you would like to join a committee we have a variety to choose from: conservation, tabling, fundraising, park cleanups, hospitality, membership and more. https://eldoradoaudubon.org/wp-content/uploads/2018/09/s2-498-copy.jpg 4000 6016 Cindy Crawford http://eldoradoaudubon.org/wp-content/uploads/2016/02/eldorado.jpg Cindy Crawford2018-09-24 04:55:102018-09-24 04:55:10Join Our New Volunteer Pool!